Here’s the kind of conversations I get into with my friends…one friend was looking for spiced peaches to serves and she couldn’t find them at the store. We started talking about how special those were when we were kids and how our mothers served them to guests. She thought it was a southern dish. A real treat to us as children. Then I was with some other friends and mentioned the spiced peaches. None of us had thought of them in years, so we started talking about how good they tasted. And about canned pears with cottage cheese, which ladies served at luncheons. And we moved on to the absolute childish joy of fruit cocktail. And how there were too few cherries in it, so you had to try to get one in your serving. We all know about trends in foods as well as other things. Today, all those fruits, along with the canned vegetables (canned corn, green beans) we loved before there were frozen vegetables, that were staples of our diets way back when, have been found to have too much sugar or salt. Today, we can get fresh food easier than we used to be able to in the cities back then or cans with less sodium, less sugar, and so on. Companies like Del Monte have been around since the 1880s, so they have always been around in our lifetimes. They were timesavers from the days of growing and canning your own, a help to the modern housewife of the 50s and 60s. I’m all for the health trend, but we all know what happens when you remember the taste or smell of something from your childhood. 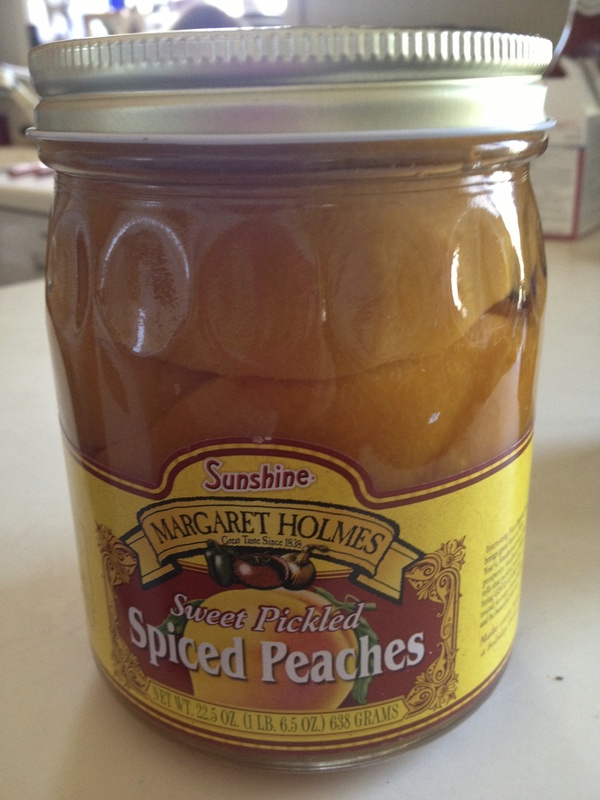 My friend and I had looked online to see if they still make spiced peaches, which they do. I was supposed to look for them at the store, but I kept forgetting. Today, I was just about to check out and decided to walk back to the fruit section. There were spiced peaches, right there in front of me. I opened the jar as soon as I got the groceries unpacked to see if they taste the way I remember them. Yum! Yes, they do. Not only do they taste the way I remember them, but now they are flavored with the memories of childhood with every bite. I may never eat them again, but today I had a sweet taste of my childhood.